I am always making some sort of dish with riced cauliflower. I know Trader Joe’s has it back in stock now (so popular it disappeared quick and they couldn’t keep up with demand), but we don’t have a TJ’s conveniently close to us so for the most part I buy Green Giant Cauliflower Bits from Super Target. The only ingredient is cauliflower, and they seem to have a steady supply of it. Each time I go I buy 3-4 bags. Cauli is one of the most versatile vegetables out there and full of nutrients. One of the simplest things you can do with it is steam it, mash it and add whatever ingredients you choose for a “mashed potato” texture and varying flavors. The Green Giant bags can be steamed right in the microwave if you want in about 4 minutes. I recently made a garlic and gouda cauli mash, and then added ham to the leftovers the next day and it was like a creamy ham and cheese casserole! Steam cauli bits in the microwave for about 5 minutes, remove and mash in a bowl. 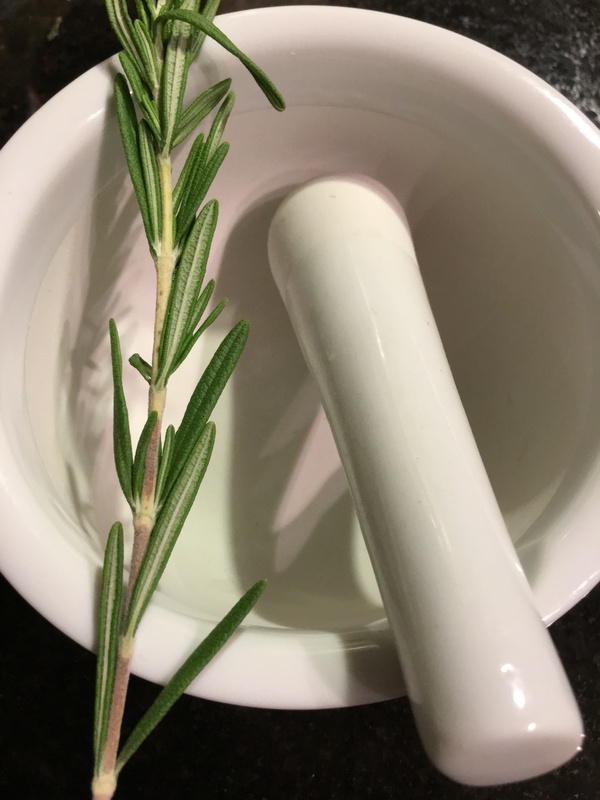 Add rosemary leaves, garlic powder, gouda and generously season with salt and pepper. Continue mashing until all ingredients are incorporated. Feel free to microwave again if the gouda isn’t melting quite enough. Hi. How have you been? Me…oh I’m good. Life has just been pretty “lifey” lately, and most of the time I wonder why at the end of the day we’re still standing, but we are! I miss blogging so much and think about posts in my head daily. I am re-committing myself to regular blogging and my gorgeous-not-yet-used-enough, kitchen! Also it’s going to help keep me busy as the Minnesota winter is quickly approaching and that’s new for me since 2002 – ah! I was devastated when Trader Joe’s announced that they couldn’t keep up with demand for the organic riced cauliflower, just after I’d discovered how awesome it was. 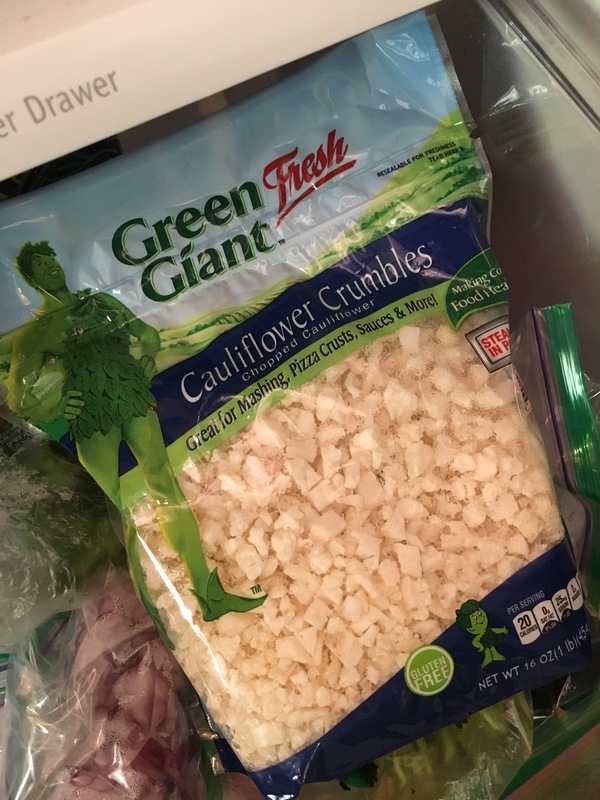 In it’s absence I happened to be at Super Target and notice that Green Giant also has a “cauliflower crumbles” product (only ingredient, cauliflower). I bought 6 bags. Ha! 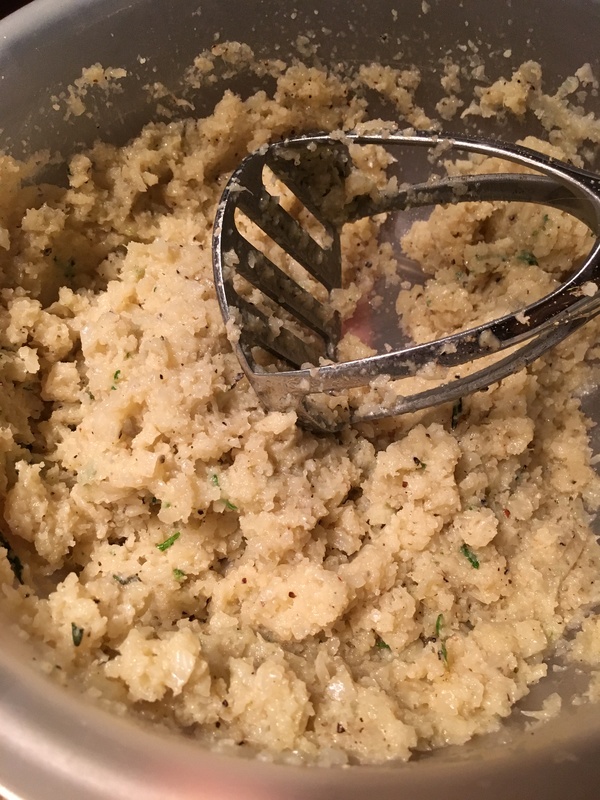 I think at this point Trader Joe’s should be stocked and ready to go, but Super Target is much closer to me 🙂 Seriously versatile and have made all sorts of good stuff, including rosemary cauli mash with ghee! Steam the cauli until soft. I followed the directions on the back of the bag and added a little extra time so it’d be extra soft/easy to mash. Once steamed I dumped crumbles into a bowl and added ghee (however much you prefer, it’s pretty rich…), bruised/crushed rosemary and salt and pepper. 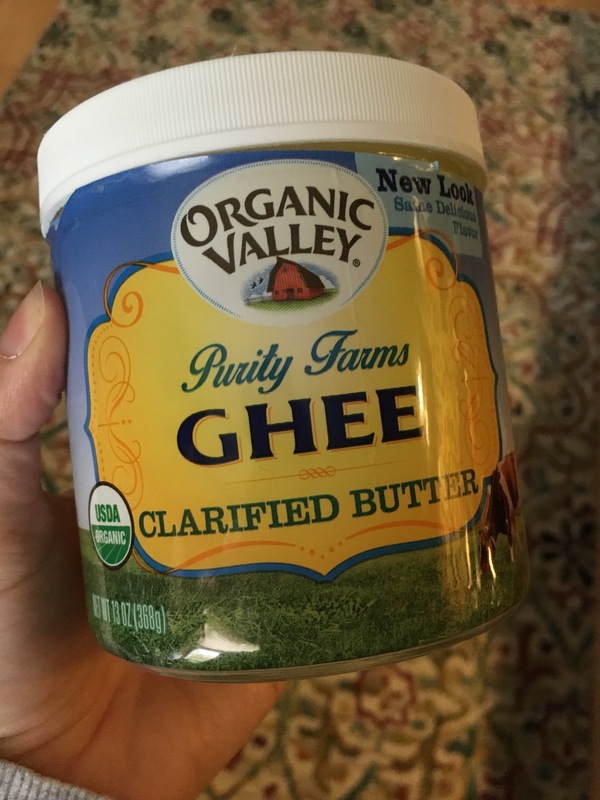 Mash until the mixture has the consistency you prefer (more ghee = creamier). Takes about 5-7 minutes and reheats very well!